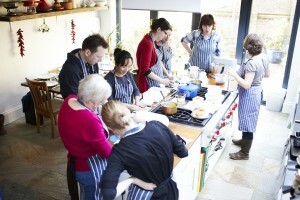 The Cooking Club is a monthly series of evening classes that you can dip in and out of as you please. At each class we cook a seasonal vegetarian supper, the stars of which are Riverford’s beautiful organic vegetables and fruits. This class is perfect for those who want to eat seasonally and are after a little recipe inspiration (as well as a fun night out). We cook together for a couple of hours – learning different culinary techniques each month – and then sit to enjoy a convivial dinner around the kitchen table with wine. The menu is usually set at the last minute so that the best seasonal produce available from Riverford at the time can be used, and so that any returning guests can be sure to learn something new. I couldn’t speak more highly of Anna’s cooking class. We learnt some great new flavour combinations and ways of using seasonal vegetables. Very fun and friendly! The Cooking Club was such GREAT fun and DELICIOUS … I very much look forward to coming back. Last night was fantastic. Was completely inspired by what we cooked and that I could potentially do that all at home! Really had a good evening – thank you.